The new year has brought a new way of working to Port Stephens. Realising there was a need for a shared working space in Port Stephens, businesswomen Beck Morley and Naomi Farrelly have established Spark CoWork in Salamander Bay. But on a deeper level, Spark CoWork offers workers a supportive business environment. “The best coworking spaces are inspiring destinations to work, connect and collaborate,” Ms Morley said. “They are about community and creating a thriving business ecosystem that fosters new ideas and supports each other. The idea for Spark CoWork was born from Ms Morley and Ms Farrelly’s own experiences in working from their homes. 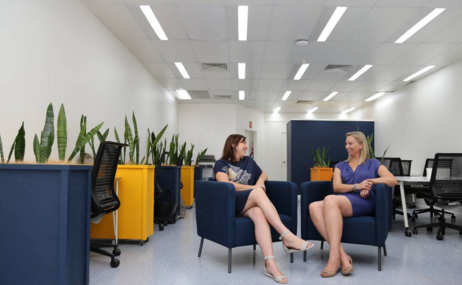 Both consultants and working mothers, the pair wanted to move their businesses out of their home offices and into a flexible space where they could have the benefits of personal connections that come from working in an office, whilst still working on their own. Initially the pair, who live in Port Stephens, looked at establishing a coworking office in Newcastle. But after talking with other consultants and business owners, felt Port Stephens was ready for it owns coworking space. In addition to those working from home, Ms Morley believes Spark CoWork will be appealing to microbusinesses, entrepreneurs, start-ups and those needing a work space whilst on holidays. Spark CoWork, which can be found in the Rigby Centre, offers a mixture of casual hot desks, permanent desks, collaborative work spaces, meeting rooms and training facilities. The coworking community can also share resources such as a receptionist, high speed internet, printing and photocopying services. The cost to use the space and services is $40 per day or $110 for one week (weekdays).